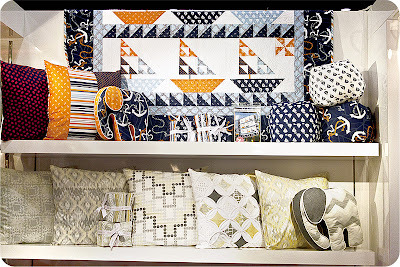 Last Fall, Dear Stella Fabrics swept us into a fashionista-frenzy with their runway-ready collections. All of their trendsetting fabrics work wonders for quilts, apparel and home dec. Though their lines run the gamut from novelty children to contemporary chic, they all feel incredibly refreshing! Indochine is one of those lines. It has so much natural texture and personality to it, a little refined and a little rough, almost tribal. All of that helped to inspire this pattern, Woodland Path, and we were thrilled when Dear Stella asked to offer it as a free pattern on their site! It’s so very perfect for this group and showcases even the large leaf prints very well. It’s a quilt of shape and contrast -- zig zags and diamonds wind their way down in brown and blue, bordered by the cream stripe and navy leaves. At 76.5" x 88.5", it makes a great bedspread or comfy couch quilt and will liven up your home! You can find the free Woodland Path pattern here and we also have kits available for sale at Fat Quarter Shop. Also, be on the lookout for this quilt at Spring Market!